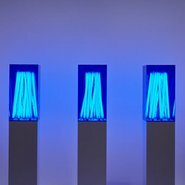 Join Wiradjuri/Kamilaroi artist Jonathan Jones in the exhibition Out of the ordinary as he talks on his work blue poles 2004. Note: this talk will take place on 17 January, not 24 January as previously advertised. The Gallery apologises for any inconvenience.